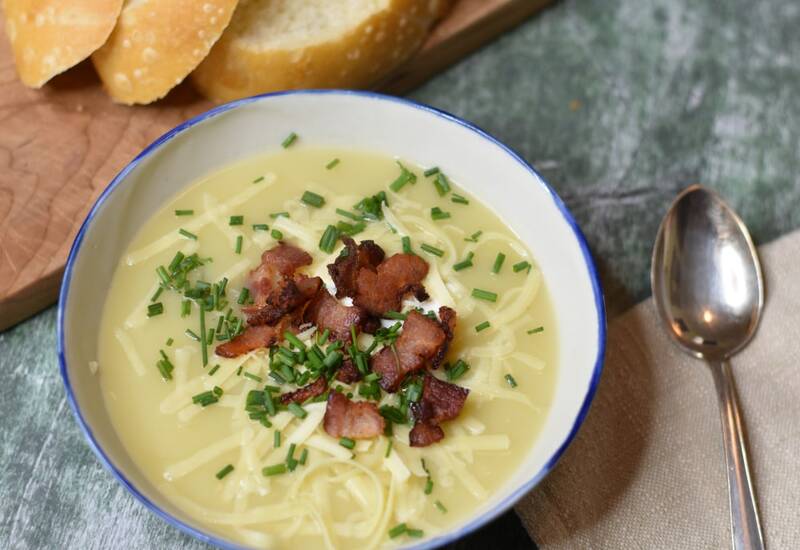 Looking for a fantastic, comfort-food soup that is deeply satisfying and perfect for a cold night? Look no further, you've found your new favorite soup! We serve this with all the fixin's and some crusty bread. Melt butter in a pressure cooker set to Sauté on Normal. Sauté leeks in butter until tender, 5 to 10 minutes. Add garlic and sauté until fragrant, about 30 seconds more. Stir potatoes, stock, and bay leaf into leeks. Press Cancel. Lock pressure cooker lid in place and set steam vent to Sealing. Select Pressure Cook on High for 12 minutes. Set steam vent handle to Venting to quick-release pressure. Remove lid and discard bay leaf. Blend potato mixture using an immersion blender fitted with the blade attachment until mixture is just smooth. Do not over-blend or your soup will be gluey! Stir milk into soup until desired consistency is reached; season with salt and pepper. Ladle soup into bowls and top with sour cream, bacon, cheese, and chives. Chicken stock can be used in place of the vegetable stock if desired. Skip the bacon and make this a vegetarian soup! Make a batch of this on Sunday and have it for lunch throughout the week, using different toppings each day. Per Serving: 477 calories; 19g fat; 71.2g carbohydrates; 10g protein; 49mg cholesterol; 812mg sodium. I used chicken stock and onions instead of leeks and it turned out delicious. I've made a potato and cauliflower soup, this was my first time doing leek and potato. It turned out thick, creamy, and flavorful. Leeks are so underrated, not sure why I didn't try this sooner. Bacon and cheese was the best for toppings. I've only had leeks a handful of times, and every time I do I'm left wondering why I don't cook with it more. I love the flavor it gives off, especially in this soup. If you like a full, thick and creamy soup then you should definitely try this. I just added cheese for topping. Excellent recipe! Don’t pass it by if you don’t have an immersion blender; just use a potato masher and mash the potatoes down. They’ll look like purée, then add your milk to the consistency you want. Easy peasy and tastes SOOOOOOO good!